Undergraduate research students funded by the Delaware Water Resources Center have developed a University of Delaware Experimental Watershed as an on campus education and research laboratory for the study of water resources. The University of Delaware campus in Newark, Delaware is uniquely suited for water resources research as the campus is situated along the fall line, the head of water – based navigation that separates the hilly, rocky Piedmont physiographic province to the north from the flat sandy coastal plain to the south. Researchers have their choice of studying streams in the foothills of the Appalachians or by moving a few thousand feet south they can study the sandy coastal plain, once the bottom of the ancient sea. 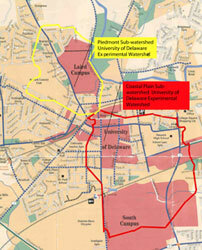 The University of Delaware Experimental Watershed also includes the White Clay Creek Wild and Scenic River, one of only two wild and scenic rivers in the USA that that flows through a university campus.